Medical Specialty | Trauma | ED Thoracotomy: Is it Just the First Part of the Autopsy? It ‘s 2 am, Saturday morning. A 26 year-old male is rushed into the emergency department. He had been involved in a heated domestic dispute and received a single stab wound to the left side of his chest with a kitchen knife. You place two 16G IV lines and intubate the patient. Following a period of progressive hypotension your patient suffers a cardiac arrest. ECG monitoring confirms pulseless electrical activity (PEA). An emergency thoracotomy is performed. This relieves his pericardial tamponade and stabilises the patient prior to transfer to the operating room. Thoracic trauma is a leading causes of death in all age groups and accounts for 25-50% of all traumatic injuries. Most thoracic trauma patients require only conservative management, but a subset of these patients will deteriorate in the pre-hospital environment or in the emergency department and require an emergency thoracotomy. Emergency thoracotomy can be defined as thoracotomy “occurring either immediately at the site of injury, or in the emergency department or operating room as an integral part of the resuscitation process”. 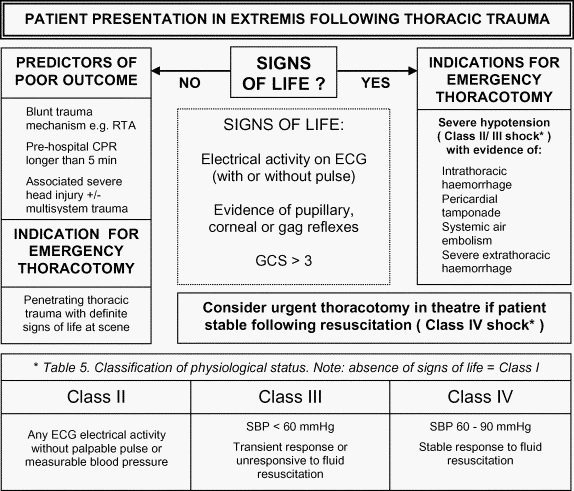 When to perform an emergency thoracotomy is controversial. Some experts describe emergency thoracotomy as a ‘futile’ procedure, with survival rates around 9-12% for penetrating trauma. Yet some institutions report survival rates up to 38%. Blunt chest trauma on the other hand has a survival rate following cardiac arrest of only 1-2%. Survival rates following blunt cardiac trauma is significantly lower than with penetrating cardiac injuring secondary to poor cardiac function (due to cardiac contusion) and a higher incidence of associated injuries such as cardiac rupture and aortic rupture. However, some studies suggest there is up to a 10% neurologically intact survival rate for patients with penetrating abdominal injury undergoing cross clamping of the descending aorta as part of emergency thoracotomy. Intubate the patient, administer 100% oxygen and ventilate. obtain large-bore IV access x2, initiate massive transfusion protocol, and commence resuscitation with blood products. Prepare thoracotomy tray and don personal protective equipment. Positon patient supine with the side to be operated on elevated to 15° by a wedge and the arm abducted. Incise through skin and subcutaneous tissue in the 5th intercostal space, starting from the costochrondral junction and continuing to the midaxillary line following the upper border of the sixth rib. The inframammary fold may be used as a guide. Divide the muscle, periosteum and parietal pleura in one layer with scissors and blunt dissection. Chest wall bleeding is usually minimal although internal thoracic arteries need to be ligated later as significant hemorrhage will occur as circulation is restored. Insert a rib-spreading retractor with the handle towards the axilla. Further distraction may be obtained by dividing the sixth rib posteriorly. To extend the incision to the right side, use strong scissors, bone cutters or a Gigli saw to cut through the sternum and into the right fifth intercostal space, mirroring the incision above. A bulging pericardium is incised vertically anterior to the phrenic nerve. The lung may need to be retracted to identify the phrenic nerve. Place a finger over any cardiac defect. If experienced, consider placing a sterile Foley catheter through the cardiac wound, inflate the balloon, then apply gentle traction to close the hole. Fluid may be directly infused into the heart if other venous access is unavailable; otherwise keep the catheter clamped. Close myocardial defects with buttressed Vicryl sutures avoiding the coronary arteries. Further procedures are undertaken as necessary, depending on the operator’s skill level. Hilar clamping may be required in the case of significant lung laceration or air embolism from bronchial-vascular communication. Perform internal cardiac massage compressing the heart between two flat hands in a hinged clapping motion. Defibrillate using small internal paddles either side of the heart with energy settings of 15-30 J (or biphasic equivalent). The LITFL team highly recommends listening to this podacst by Scott Weingart: EMCrit Podcast 36 — Traumatic Arrest. 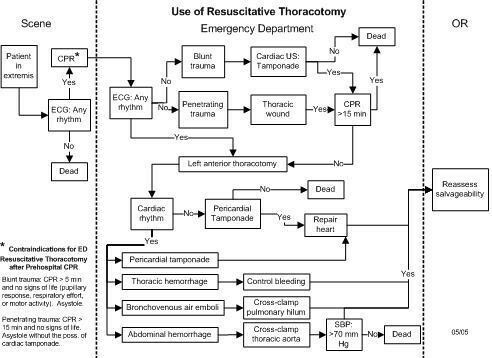 Also, for an update on when to perform emergency thoracotomy, check this case-based Q&A: Ruling the Resus Room 005 — To thoracotomy, or not to thoracotomy? Greaves, I. Porter, K. Garner, J. (2009). Trauma Care Manual 2nd Ed. London: Hodder Arnold.